Realme U1 Vs Realme 2 Pro - Which is the better Smartphone? Chinese company already launched his two great smartphone with the name of Realme 2 Pro and Realme U1. Realme U1 is latest smartphone launch by Oppo-spinoff brand Realme, which also introduced the Realme 2 Pro. Both are medium budget smartphone. 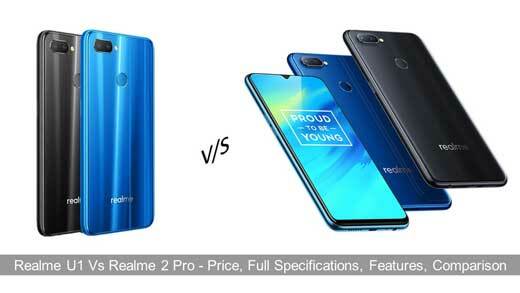 In this article we have to discuss what is the difference between Realme U1 Vs Realme 2 Pro. Latest launched Realme U Series smartphone is specially focused on photography, and comes with several latest features. Most of persona ask that both smartphone are similar, but in this article we have to discuss which one is better than another. Realme U1 latest launched smartphone, first flash sales started started on 5th December’2018 on Amazon website. Chinese company Realme has launched Realme U1 smartphone in two variants 3+32GB/4+64GB which is priced at Rs. 11,999 and Rs. 14,499. This is the first smartphone which comes with MediaTek Helio P70 chip set. If we talk about the Realme 2 Pro, this smartphone also launched by the company in September 2018. Realme 2 Pro smartphone comes in three variants 4+64GB at Rs. 13,990, 6+64GB at Rs. 15,990 and 8+128GB at Rs. 17,990. The Realme U1 smartphone comes with 6.3 inch smartphone with 1080×2340 pixels resolution. This smartphone is powered by 2.1GHz octa-core processor which comes with 4GB high speed RAM and 64GB internal storage memory. You can easily expanded storage memory up to 256GB via microSD card. Realme U1 smartphone priced under Rs. 15,000 only. This smartphone runs on Android 8.1 Oreo operating system and comes with 3500mAh non removable Li-Ion battery. The Realme 2 Pro smartphone comes with 6.3 inch smartphone with 1080×2340 pixels resolution, which is priced at Rs. 13,990. This smartphone runs on Android 8.1 Oreo operating system with 3500mAh non removable Li-Ion battery. The Realme 2 Pro smartphone comes in three variant 4/6GB RAM with 64GB storage capacity and 8GB RAM with 128GB storage capacity. Realme 2 Pro 4+64GB smartphone priced at Rs. 13,990, 6+64GB smartphone priced at Rs. 15,990 and 8+128GB smartphone priced at Rs. 17,990 only. Such features will be included for filling the low end of the Android Oreo 8.1. So that you never get any problems with the space. The Realme U1 smartphone comes with 13-megapixel (f/2.2) primary camera and a 2-megapixel (f/2.4) secondary camera on the rear and a 25-megapixel front shooter for selfies, with depth sensor. The dimension of this smartphone measured in 157 x 74 x 8mm with 168g weight. Realme 2 Pro smartphone comes with 16-megapixel (f/1.7) primary camera and a 2-megapixel (f/2.4) secondary camera on the rear and a 16-megapixel front shooter for taking selfies, with depth sensor. The dimension of this smartphone measured in 156.7 x 74 x 8.5mm with 174g weight. The Realme U1 dual sim GSM and GSM smartphone that accept Nano SIM and Nano SIM. Connectivity options include 3G, 4G with Wi-Fi, GPS, Bluetooth, USB OTG, Micro-USB, FM feature. You can also get Face unlock, Fingerprint sensor, Compass, Magnetometer, Proximity, Accelerator, Ambient light sensor. This smartphone supports Volte/4G/3G/2G on compatible networks. This smartphone is available in three Ambitious Black and Brave Blue. The Realme 2 Pro dual sim GSM and GSM smartphone that accept Nano SIM and Nano SIM. If we talk about the connectivity options, include 3G, 4G with Wi-Fi, GPS, Bluetooth, USB OTG, Micro-USB, Hotspot. You can also get Fingerprint sensor, Gyro, Compass, Proximity, Accelerator features. This smartphone supports Volte/4G/3G/2G on compatible networks. This smartphone is available in three colors Black, Deep Blue, Light Blue. Let’s start discussion what the main important difference between Realme U1 Vs Realme 2 Pro Smartphone. Processor 2.1GHz Octa-core processor, Mediatek Helio P70 Processor, Android 8.1 (Oreo) O.S., GPU Mali G72 MP3. 1.8GHz Octa-core processor, Android 8.1 (Oreo) O.S., GPU Adreno 512. Memory Available in two variants 3+32GB/4+64GB. Expandable up to 256GB via microSD. Available in three variants 4+64GB/6+64GB/8+128GB. Expandable up to 256GB via microSD. Display 6.3″ LTPS IPS LCD capacities touchscreen display. 1080 x 2340 resolution, Corning Gorilla Glass 3 with Color OS 5.2. 6.3″ IPS LCD capacitive touchscreen, 16M colors. 1080 x 2340 resolution, Corning Gorilla Glass 3 with Color OS 5.2. Dimensions Height:157 mm, Width: 74 mm, Thickness: 8 mm, Weight: 168 g. Height:156.7 mm, Width: 74 mm, Thickness: 8.5 mm, Weight: 174 g.
Battery 3500mAh. 5 V / 2A charging power adaptor. Micro USB Cabel. 3500mAh non removable Li-Ion battery. Connectivity Dual Nano SIM/MicroSD. Supports WIFI 802.11 a/b/g/n/ac. Bluetooth 4.2/HID. Volte/4G/3G/2G on compatible networks. Dual Nano SIM/MicroSD. Supports Wi-Fi 802.11 а/b/g/n/ac, dual-band, WiFi Direct, hotspot. Bluetooth 5.0, A2DP, LE, microUSB 2.0, USB On-The-Go, AGPS. VoLTE/4G/3G/2G on compatible networks. Price & Color Priced under Rs.15,000. Color: Ambitious Black and Brave Blue. Priced: 4+64GB at Rs. 13,990, 6+64GB at Rs. 15,990 and 8+128GB at Rs. 17,990. Color: Black, Deep Blue and Light Blue. Both Realme U1 and Realme 2 Pro smartphone comes under medium range handset. You can choose any one after watching the difference between them and choose best one. As per my conclusion Realme U1 is much better than Realme 2 Pro. Realme U1 comes with great price and first smartphone which comes with MediaTek Helio P70 processor and other impressive features. This smartphone has much better fingerprint and face-look sensor, better camera experience in low light than others.